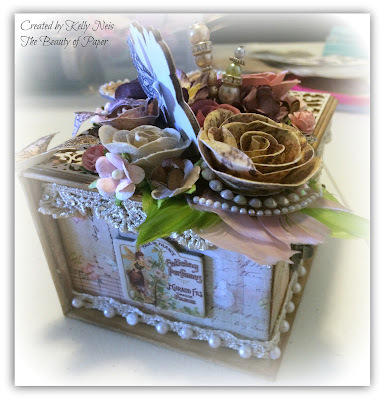 I ordered the complete set of the Prima Butterfly Collection by Jodie Lee and I just fell in love with it. I have so many plans for this set. 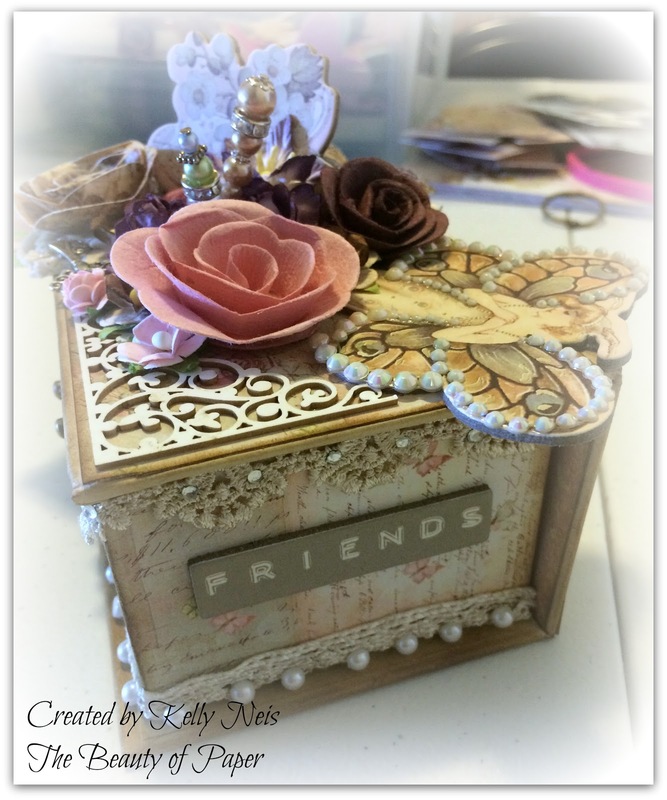 I paired Prima with G45 box and tags set. This is the front and side of the box. Most of the flowers and all the chipboard and papers are from Prima's Butterfly Collection. Here is the top and sides of it. The crystals are Prima's Say it in Crystals. They are iridescent and I love how they go everywhere even though the are circles. I just cut them apart. G45 box came with 3 tags and since I have minimal supplies for mixed media, I blended white paint with my distressed inks and swirled them with my fingers to make the background colors. I frontage around the edges too. Above are the fronts and the bottom are the backs. Thank you for stopping by today, Hope you enjoyed my little box and are inspired to try one too. This is stunning Kelly. Your project has so much gorgeousness - the flowers are beautiful and such fabulous butterflies. Wowzer factor. Happy a lovely Friday and weekend. Wow! Wow! Wow! I am in love -- Kelly this is fabulous!!! Oh if only I could be half as good! We did have a thrill tonight. There is a bar on the beach right down from where we live - we go late in the afternoon and watch the people on the beach and the boats. (yes and have a cold draft beer!) We actually got to see a submarine coming in to port! Truly amazing. I had cold chills like crazy. The submarine base is in Southern Georgia but really right up the beach from us. I am still in awe!! Next time you come to Florida, you need to visit Amelia beach! Wow ! Amazing creations, so prettyyyyyyyyyyy ! Total beauty!!! Such an amazing project! Thanks for joining us at 7 Kids College Fund! Kelly, this is a stunning showcase of nature's beauty. :o) You were indeed inspired by the collection and the result is spectacular. The texture throughout is wonderful.. 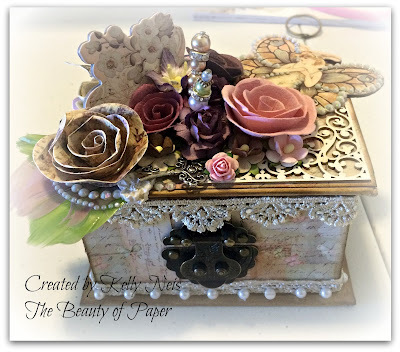 I especially love the trims, pins, and chipboard. The design itself is so beautiful. Thank you for sharing your creativity with us at Live & Love Crafts! 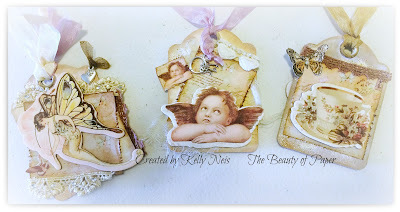 Wow Kelly this is shabby chic art at its best. Just adore the tags you also made. wow.. this is spectacular. I love this project!!! The tags are also so special. Kelly you have totally outdone yourself! This box is phenomenal as well as the gorgeous tags. Gee I nearly missed this post and I'm so happy I didn't. Your art is always outstanding. Looking forward to what's next! Oh dear, oh dear - so long since I've managed to come by for a visit... I do hope all is well. Last time I was here, you'd just had the disastrous fire - really hope you're back up and running... it certainly looks as though you are from these fabulous makes. The tiny tags are just adorable, and the box for them is simply stunning. Wonderful work! I was going to start my comment with three wows but Sandy beat me to it. 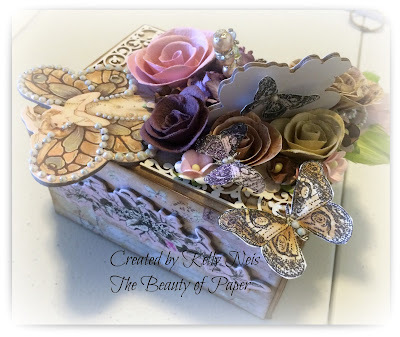 I went right over and looked at the butterfly collection and no wonder you ordered it, good grief so scrumptious! 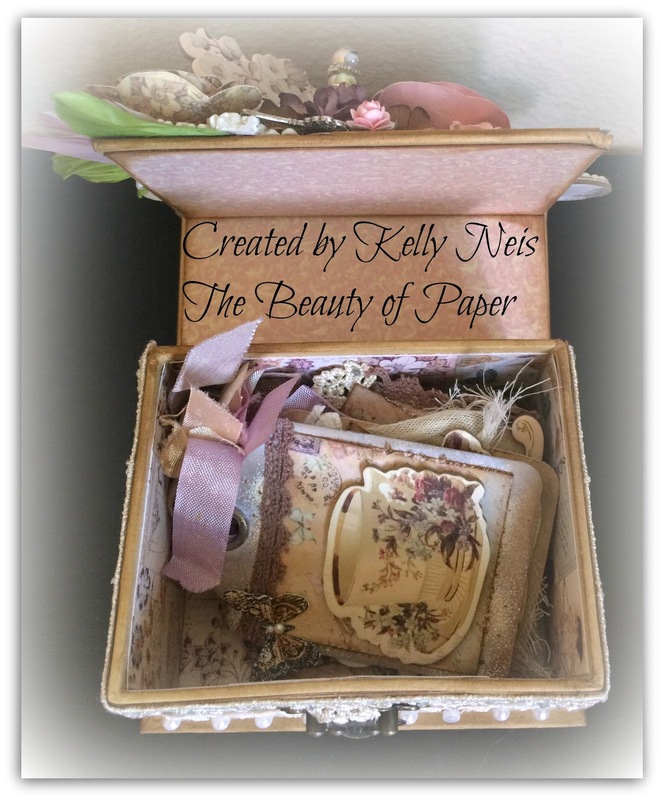 What you've created here is magical and so tender and truly a holder for special keepsakes. WOWSA !!!!! This is amazing!!!! Thanks for sharing it with us here at www.7kidacollegefund.com! Gorgeous box with lots of beautiful details. Love the pretty tags as well. Perfect for LLC's "In the Garden" challenge. Thanks for joining us!